You could stand in one place for a very long time and still see something new. It’s a puzzle, an archive, a window, and a work of art. It tells stories small and large. It is a gestalt of individual gifts pieced together to define a complete community. 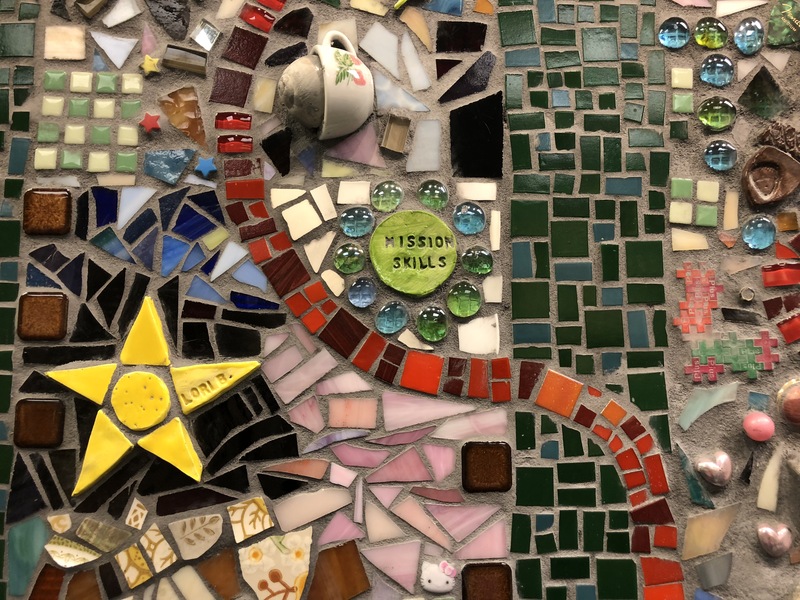 It is “ONE COMMON THREAD,” the new mosaic art installation that welcomes you to the Fine Arts Wing at The Lexington School, and it is more than meets the eye. If you haven’t seen the beautiful, collaborate mural in the Fine Arts Wing the students created throughout the year last year, it’s a must see. 15 students in the After School Fine Arts Program “The Art of Mosaics” with Alice Garrett, began the year last year learning the art form, eventually working towards the completion of this first collaborative mosaic piece at The Lexington School. Thanks to the support of The Simpson Art Endowment, Community artist, Alice Garrett, joined the After School Fine Arts Program and her passion for mosaic arts is as clear as the glass she uses to make and teach such beautiful forms. Alice’s background includes work in the corporate interiors industry as an interior designer, project manager, and corporate art consultant. She entered the world of mosaic through pique assiette. Back by popular demand, Alice will return to the After School Fine Arts program this year starting November 26th, offering her Mosaic Arts class to 4th-8th graders. There are new After School Fine Arts classes each year at The Lexington School. This year’s program is a mosaic of its own, geared towards a variety of art forms for a variety of ages. The Lexington Children’s Theatre is back with “Create-A-Play” and “Performance” workshops, Jo-Ellen Fischbach will continue to nurture burgeoning photographers, Rafaela Risco, Academy Director of the Kentucky Ballet Theatre, brings “Creative Movement with Ballet” and “Acrobatics” to our littles, and the list goes on and on. Printmaking, kinetic sculpture, and weaving with wool, it’s an all-star lineup. After School Fine Arts programs, like the mosaic mural, have one common thread: they build on a collaborative community to foster creativity in each and every child.